Rebels Review: "The Holocrons of Fate"
Darth Maul reared his horned head for the first time in Season Three of Star Wars Rebels this week, and things got a bit crazy! "The Holocrons of Fate" picked up where last week’s premiere left off, dealing with fallout from last season's finale and laying the groundwork for the rest of the season. Let's begin with what was easily the best part of the episode--Maul. In "Rebels Recon" this week, executive producer Dave Filoni said that Maul was seeking a purpose in this episode. This is the perfect way to describe Maul's actions in “Holocrons.” Every time we've seen Maul before he's had a purpose, whether as Sidious' assassin, seeking revenge on Obi-Wan, or building up his crime empire. Even when we saw him on Malachor last season, Maul had purpose--granted it was a simple purpose, to escape the planet, but it was a purpose nonetheless. Now, he's lost in a galaxy that seems to have no place for him, his brother and mother are dead, and his crime empire has evaporated with some of his best warriors now fighting for his old master who, incidentally, wants him dead. That's where Ezra comes in. 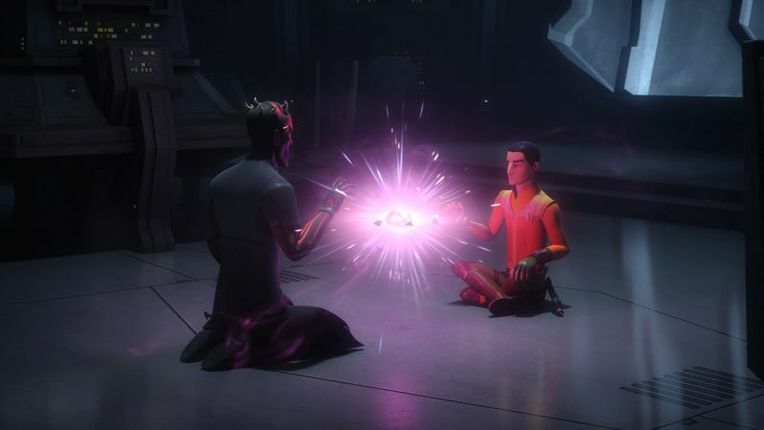 Maul's interest in Ezra seems to be securing some sort of legacy, an apprentice to train who will live on and pass on his teachings once he's gone. This seems to have involved Maul separating Ezra from the rest of his crew and filling his head with the teachings of the dark side (as discussed last week, he even managed to do this without being present by leaving Ezra with the Sith holocron and blinding Kanan). Fortunately for Ezra, Maul hasn't been able to get ahold of him for very long because his friends have always managed to step in at the right moment before things went too far. In this episode he once again tempts Ezra to the dark side, this time with the hidden knowledge that joining the two holocrons will reveal. It's hard to tell what exactly Maul was hoping to see when he opened the holocron. He tells Ezra he’s seeking "hope", which is not exactly what you would expect a dark side user to want. Did he want the holocrons to give him hope or did he want to turn Ezra to the dark side, thus giving him hope for his legacy? I doubt we'll ever know for sure (but that's part of the fun of being a Star Wars fan), and, either way, what he saw, although not shown to us, was very exciting. After looking into the holocrons, Maul left the episode repeating "he lives" to himself--and (to me) this can only really mean one thing: he's going after Obi-Wan Kenobi. It seems that the reborn Maul has come full circle. When he was first introduced on The Clone Wars and we learned that he survived being cut in half by Obi-Wan in The Phantom Menace, he had only one goal: kill Obi-Wan. As The Clone Wars progressed, Maul's goals became more nuanced and far grander than the death of a single Jedi master (though he still took every opportunity he could to make Obi-Wan suffer). Now, with the galaxy having left him behind once again, Maul seems poised to return to his original purpose. This almost assuredly means we'll see Obi-Wan appear on Rebels down the line. He’s already made one appearance on the show, back in the very first episode, "Spark of Rebellion", as a message saved on Kanan's holocron from between the scenes of Revenge of the Sith. When we see Kenobi he will most certainly look more like Alec Guinness, a first for Star Wars animation. But that raises another question: if we see Obi-Wan, will we also see young Luke? If we do, it will probably be a cameo, but it does seem more possible now than ever before. Speaking of Luke, what Ezra saw in his vision was just as exciting. Ezra says his goal is to destroy the Sith and when he looks into the holocron he sees "Twin Suns", which seems to be an obvious reference to Luke Skywalker's current residence on Tatooine. Could this lead Ezra to Tatooine and Luke? He likely won't get to Luke, but he too could meet Obi-Wan (perhaps around the same time Maul is headed there), who might give him some guidance that sets him down a different path. But that's just speculation on my part. Earlier in this week’s installment, before Ezra and Kanan encountered Maul in the flesh, they first had to retrieve the Sith holocron which Kanan left with Bendu last week. This is where I feel the episode stumbled quite a bit. Ezra and Kanan's resolution in the caverns felt rather quick, and merely a repetition of some of what had passed between them last week. The concept was a good one, but we never really had a chance to delve more deeply into what was causing the imbalance between them beyond what was already seemingly resolved last week. I almost think this story would have been better served as two episodes, one with Ezra and Kanan resolving their issues in the caves while retrieving the holocron and the other dealing with Maul (maybe we could have gotten a glimpse at some of those visions had the episode had more time). Overall, "The Holocrons of Fate" offers some intriguing insights into Maul in this time and sets up an exciting new plot line for the show to follow. But too much time was spent on rehashing plot points that should have been clear after last week’s show. There is definitely way more good than bad to be had in this episode, but all the same, it falls short of its full potential. Check out my reviews of previous Star Wars Rebels episodes here. What if instead of obi wan living it is savage mauls talking about.